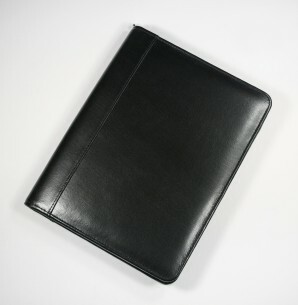 The Marylebone A5 zipped folder is the ideal promotional give away for your most valued and cherished customers. Give a gift which will be kept and used every day forever. Brand it with your logo and your company wont be forgotten. This item has an internal leather spine, clear business card pocket, document and CD holder and a pen pocket (pen not inclusive). Made of Marylebone leather which is genuine and soft. Available in black or navy - pantone matching the leather is available - for prices for this, please do contact us. We typically print by debossing and foil blocking your logo into the leather. Additionally, other methods can be used to brand this item - please speak to us for further options and prices.